Narrowband IoT offers advantages such as reduced cost and reduced power consumption for an increased coverage area which is primarily boosting the adoption of emerging narrowband IoT technology. This wireless network technology is expected to dominate the Low-Power WAN (LPWAN) field in 2-3 years time and overpower other players like Sigfox and LoRaWAN. At the recently concluded Mobile World Congress 2017, Narrowband IoT (NB-IoT) made its mark as one of the hottest IoT trends in cellular technologies, with several leading telecom players unveiling their respective rollouts of this IoT-enabler. A list that includes Deutsche Telekom, AT&T, KDDI, KPN, NTT DOCOMO, Orange, Telefonica, Telstra, TELUS, Verizon and several others. Many safety-critical IoT devices are located in remote locations and are difficult to locate, hence requiring a device transmitter to operate at a very high power that results in battery drainage. Existing cellular standards don’t have the capability to support power consumption. A new evolved cellular technology is required to meet the connectivity needs of the rapidly growing Internet of Things (IoT). 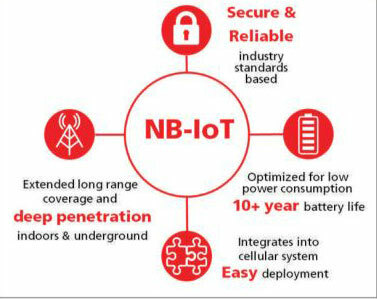 NB–IoT – (Narrow band IoT) is a Low power WAN (LPWAN) radio protocol which a standardized technology that can be developed to connect a wide range of IoT devices to use cellular telecommunication bands with a specific design for significantly reduced power consumption. NB-IoT is also called LTE Cat-NB: It is most suitable for applications that require transmission of moderately complicated data with less recurrence so that is can develop new applications. The deployment cost is significantly reduced with the reuse of existing infrastructure. Also, time-to-market can be significantly hastened owing to infrastructure reuse. Adoption of NB-IoT can help in providing improved indoor coverage support to a massive number of low-throughput nodes with low-delay sensitivity, ultralow device cost, lower device power consumption, and optimized network architecture. Narrowband IoT (NB IoT) is a new way of communicating with “things” that require small amounts of data, over long periods, in hard to reach places. 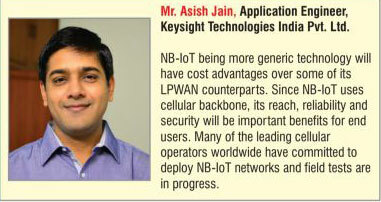 Mr. Asish Jain, Application Engineer, Keysight Technologies India Pvt. Ltd. Narrow Band Internet of Things (NB-IoT) is a clean slate cellular technology designed specifically for IoT applications. NB-IoT inherits many LTE characteristics, such as the physical layer foundation and the higher layer architecture, but it is incompatible with existing 3GPP devices. To reduce device complexity and cost, three major design changes have been made for NB-IoT w.r.t. LTE. First, NB-IoT follows a halfduplex design so there is no need for expensive duplexer filters to isolate the transmit and receive chains; you can use a switch instead. Second, MIMO is not supported, particularly spatial multiplexing techniques, and therefore NBIoT device is only required to implement one receiver chain. Finally, and very importantly, the channel bandwidth is only 180 kHz (LTE max. BW per carrier is 20 MHZ which reduces the overall platform cost. Although NB-IoT inherited many LTE features, it is targeted at low data rate and low power applications which is mandatory for IoT applications. While the LPWAN market has existed for some time, existing solutions are fragmented and soft-standardized, leading to security weaknesses, reliability challenges, and potentially high operational costs due to incompatibility with existing infrastructure. NB-IoT being a 3GPP cellular technology has multiple advantages like standardization, wide acceptability in wireless ecosystem and ease of deployment by operators. In addition to above, NB-IoT being more generic technology will have cost advantages over some of its LPWAN counterparts. Since NB-IoT uses cellular backbone, its reach, reliability and security will be important benefits for end users. NB-IoT uses LTE spectrum. It is a licensed spectrum. Other LPWAN technologies like LoRA use unlicensed spectrum. Using NB-IoT for LPWAN has advantage of using licensed spectrum. In addition, it gives advantage that it uses secured interfaces. Also, since it is defined by 3GPP, the roaming agreements can easily be defined between operators. CAT-NB devices use narrow band spectrum (200 Khz) and can use same spectrum which is used for commercial networks, but use the guard band which is not used for commercial user connections. Thus, operators do not have to purchase another spectrum and still have non-overlapping slots for commercial subscribers and for IOT devices. Thus, this is useful for sensors. CAT-M1 devices on other hand require different low bandwidth spectrum (1.3 MHz). A CAT-NB device can never be paged, but a CAT-M1 device can be paged. Hence if there are IoT devices that require mobility and at same time network can also request asynchronous responses from device, then CAT-M1 is preferred. e.g. for pet/kid tracking this is very useful. There are some IoT devices which require high bandwidth. They use normal LTE connection. LPWAN technology solution was deployed around 5 – 8 years ago. However, they are non-standardized and fragmented. Hence many had doubts and concerns about its reliability, security, operational costs and a newer technology network rollout has its own challenges. That’s were 3GPP introduced NB-IoT (narrow band IoT or Cat NB-1) technology in the Release 13, addressing the above-mentioned concerns and primarily aiming for wide range of IoT devices. Narrowband IoT has been defined by 3GPP to enable rapid adoption andseamless integration into existing LTE networks, delivering the advantage of using the same cellular network that service providers already have in place, with simple modifications such as extended coverage and low power consumption to accommodate the use cases of IoT. NB-IoT has emerged as a key technology enabler to support wireless connectivity in licensed spectrum to connected devices. IoT connected devices will reshape wireless network capacity and coverage demand due to their diversity of applications, ranging from static sensors with sporadic communication, to mobile sensors with latency constraints. The ability to evolve the radio access network and quickly implement NB-IoT technology is critical for network service providers to meet growing demand for IoT services. • Ubiquitous connectivity and coverage – NB-IoT can help in supporting massive number of devices by establishing networks that can connect to billions of nodes. They are designed for extended coverage indoors with low device complexity providing long range connectivity and communication. • Low Power Consumption – NBIoT doesn’t need to run a heavy OS like Linux or do much signal processing making it more power efficient as compared to other cellular technologies. One may be running a small RTOS to connect to NB-IoT network and still get the same performance (if not better). • Low Device Cost – Simpler to create with lower complexity, cost of device is considered to be significantly low and turns out to be around $5 per module. One does not need CPUs running at multiple GHz but simplified MCUs can suffice. • Multi–year battery life – With the optimized power consumption capability, NB-IoT can support a multi-year battery life for your devices. • Secured – NB- IoT is considered to be secured similar to 4G, with all encryption and SIM-based authentication features. • Faster time to market – NBIoT is easy to deploy as it can either be deployed for In-Band, Standalone or Guard-band resulting in faster time to market. We believe in a wireless future with secure, stable, and robust connectivity. Many potential “connected things” are located in remote or hard to reach areas, at long distances from the next cellular base station or in shielded areas, such as deep within buildings or underground structures. When there is coverage, it is often poor and requires the device transmitter to operate at high power, draining the battery. 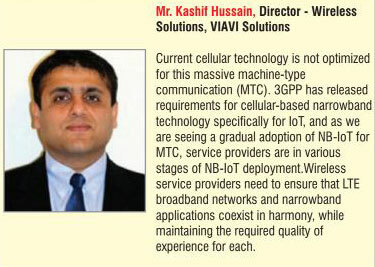 Additionally, cellular networks are not optimized for applications that only transmit small amounts of infrequent data. Further, the existing cellular standards don’t support power saving capabilities, which makes these standards unsuitable for inexpensive devices that require battery lives of several years. NB IoT will connect many more devices to the Internet of Things and make many new applications a reality. It is optimized for applications that need to communicate small amounts of data over long periods of time. Since it operates in licensed spectrum, it is secure and reliable providing guaranteed quality of service. Using other cellular air interfaces for a typical NB IoT application would be too expensive, as NB IoT applications don’t need all their capabilities. When will NB-IoT be available? NB-IoT is expected to be available in core developed countries and cities by 2018 and reach its full coverage by 2020. Many big giants in telecommunication field —like Huawei, Ericsson, Qualcomm, and Vodafone – have been actively involved in putting NBIoT standard together. It all started in 2014 when Huawei acquired Neul, a startup that was working in and had some intellectual property in NB-IoT field. From recent steps made, engineers from Vodafone and Huawei completed the world’s first trial of standardised NB-IoT on a live commercial network in Q4 2016. In October 2016, Vodafone announced that the world’s first live commercial NBIoT networks will be in Germany, Ireland, the Netherlands and Spain. In January 2017, Vodafone’s first commercially available NB-IoT network became operational in Spain, starting off with Valencia and Madrid. NB IoT is well suited for monitoring gas and water meters, via regular and small data transmissions. Network coverage is a key issue in smart metering rollouts. Meters have a very strong tendency to turn up in difficult locations, such as in cellars, deep underground or in remote rural areas. NB IoT has excellent coverage and penetration to address this issue. NB IoT can help local government control street lighting, determine when waste bins need emptying, identify free parking spaces, monitor environmental conditions, and survey the condition of roads. NB IoT connected sensors can send alerts about building maintenance issues and perform automated tasks, such as light and heat control. NB IoT can also act as the backup for the building broadband connection. Some security solutions may even use LPWA networks to connect sensors directly to the monitoring system, as this configuration is more difficult for an intruder to disable as well as easier to install and maintain. NB IoT will provide wearable devices with their own long range connectivity, which is particularly beneficial for people and animal tracking. Similarly, NB IoT can also be used for health monitoring of those suffering from chronic or age related conditions. NB IoT connectivity will offer farmers tracking possibilities, so that a sensor containing a u blox NB IoT module can send an alert if an animal’s movement is out of the ordinary. Such sensors could be used to monitor the temperature and humidity of soil, and in general to keep track of attributes of land, pollution, noise, rain, etc. Keysight is at the forefront of proving test platforms for NB-IoT technology. We offer a comprehensive set of design, verification, functional, and conformance test solutions that support the entire device development cycle of NB-IoT. Keysight is working with every leading company working on NB-IoT across the ecosystem, that is, standards bodies, chipset companies, module/device makers and operators. 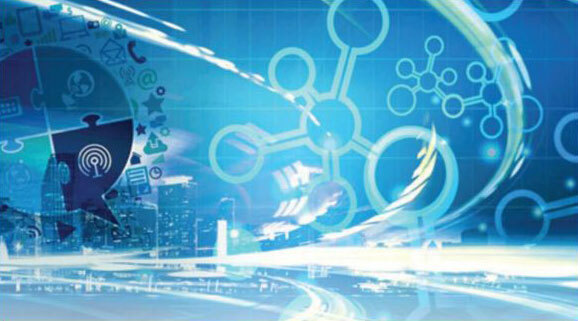 Keysight UXM E7515A offers designers the ability to optimize IoT designs for critical performance attributes such as power consumption, RF performance and interoperability, by simulating the real world in the lab. The UXM is the world’s first wireless test set to demonstrate connectivity with an NB-IoT device that complies to the NBIoT standards. Keysight DC Power Analyzer N6705C with SMU is platform of choice for every engineer working on optimizing power consumption of NB-IoT devices. Since IoT devices are aiming for >10 years of battery life, their current consumption is in the order of μA and nA. Keysight introduced CX3300 series of Device Current Waveform Analyzers which is the world’s first instrument that clearly and precisely visualizes low-level current waveforms previously unmeasurable or undetectable. Below snapshot captures Keysight’s solutions for NB-IoT technology through its stages of evolution, that is, R&D, Verification, Acceptance and Manufacturing. 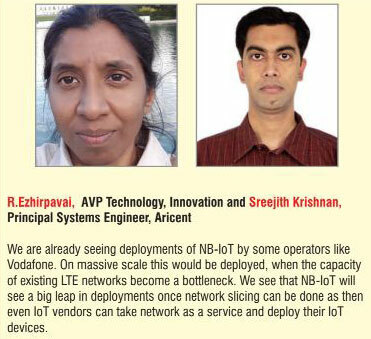 Aricent has solutions in NB-IoT from device to infrastructure. • Aricent has partnered with Qualcomm to create a wearable device which is based on NB-IoT. • Aricent ADAPT solution for NB-IoT with Qualcomm chipset of MDM-9206 is planned for addressing NB-IoT and Cat-M1. • Aricent has LTE eNodeB software frameworks which support NB-IoT. • Aricent has a core network – CSGN- which is supporting NBIoT feature required as per 3GPP for Cellular IoT needs. • Measures the interference and performance impact the NB-IoT signal may have on the LTE wideband signal. • Provides comprehensive analysis, including signal power levels, digital demodulation analysis and interference analysis down to the single Physical Resource Block (PRB). These detailed measurements provide a full picture of how well the network is operating in terms of performance, coverage and data traffic capacity, while identifying potential issues that need to be resolved, such as interference between the NB-IoT signal and the standard cellular signal used for subscriber ommunications.